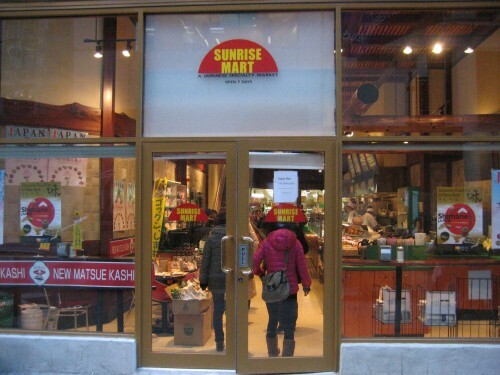 Sunrise Mart Serves Burgers With Crispy Rice Buns! One night while walking to the train after work, I noticed signs on Sunrise Mart (41st btw. Madison+5th) advertising their “New Rice Burgers.” What’s a rice burger? Basically instead of buns they used two pan fried pieces of flattened out mushed up rice patties. This wasn’t my 1st experience with this sort of sandwich/burger. There used to be a food truck in LA that specialized in using rice as buns and surprisingly did a pretty darn good job at it. After seeing the signs for it at Sunrise Mart, I was curious and decided to check it out. 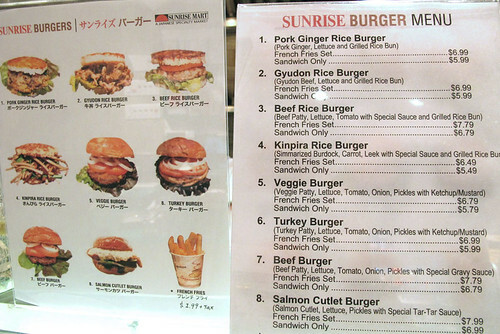 Looking at the menu, Sunrise Mart is really stretching the meaning of the word “burger.” Their #1 and #2 “Burgers” ($5.99), feature sliced meat (not a burger), although their #3 is an actual burger. Semantics be damned, in the end I got the #1 Pork Ginger Rice “Burger” because who doesn’t love pork and ginger. Beware, this sandwich is messy. 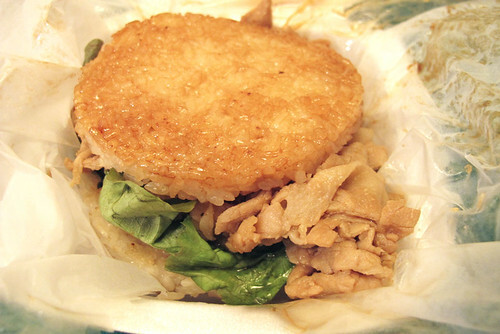 The juice from the pork made the bottom rice bun soggy and the whole sandwich was pretty hot to actually hold on to. I tried to pick it up and hold it like a proper sandwich but the slices of pork kept sliding around. I ended up using chopsticks to pick at it. It wasn’t till the last few bites that I managed to eat it the way it was meant to be eaten. The sandwich was okay. A bit small for the price but the ginger pork was mighty tasty. Thinly sliced, the pork was salty and tender. Next time if I wanted a sandwich I’ll probably stick with the ones with good old fashion bread buns and if I wanted the ginger pork I rather pay $1 more for the ginger pork rice bowl. Posted by Donny T. at 11:30 am, February 27th, 2012 under Sunrise Mart. Ronin (formerly Washoku) also serves these. They used the rice buns as a selling point when they re-opened. I haven’t tried them, but I recall people saying good things. I agree with the review – the burger is pretty messy. Based on the review, I wanted to check out the pork ginger burger. I ordered mine to go and by the time I walked back to my office (less than a 2 min walk), the sauce had seeped out of the container and all over the others items in the bag I carrying. Not to mention, the lettuce was soggy and it was difficult to eat by hand. That being said, it was ok but could use more flavor such a scallions.